Schuyler Fisk, Peter Horton, Lance O’Reilly, and Aaron Michael Metchikand wear optical white, black and red high top Converse “Chuck Taylor” All Stars in the film. The Babysitters Club is a film based on the popular Ann Martin book series about a group of seven thirteen-year-old girls who are best friends and have organized their babysitting skills into a collective to make extra money in their comfortable Stoneybrook, Connecticut suburb. Each girl has her own problems and desires, but the main focus is on Kristy (Schuyler Fisk), the tomboyish leader of the group. The other girls are Stacey (Bre Blair), the group’s diabetic treasurer, who is boy crazy and has a major crush on Luca (Christian Oliver) an older teen visiting for the summer, Mary Anne (Rachel Leigh Cook) Kristy’s oldest friend, who is a quiet opposite, Mary Anne’s environmentally sensitive sister Dawn (Larisa Ollynix), the artistic Claudia (Tricia Joe), Mallory (Stacey Linn Ronsower) a budding novelist, and Jessi (Zelda Harris) who wants to be a dancer. As the story opens, Kristy, who has been living with her stepfather and mother (Bruce Davison and Jessica Needham), is contacted by her biological father Patrick (Peter Horton), who suddenly shows up in town after years of absence and wants to spend time with her, but in secret from everyone else. At the same time, the club has decided to open a day summer camp for younger kids, so soon their backyard is filled with 30 little kids. At first the girls are a little overwhelmed, but with the help of a couple of boy friends (Asher Metchik, Austin O’Brien) they soon have them organized and busy with fun activities. The only problems are their next door neighbor, Mrs. Haberman (Ellen Burstyn) who doesn’t like the noise or the damage caused to her plants, and three rival girls who trade pranks with the Babysitters Club. Kristy meets with her father who has suddenly come back into her life. Things start to get a little complicated when Kristy seems preoccupied and distant from her family and the other club members, staying out late at night and leaving the day camp instead of being there all the time. This is because she is spending time with Patrick, but has promised not to reveal his presence in town to anyone else, although her best friend Mary Anne shares her secret because she was with Kristy when she first visits Patrick at his mobile home. At the same time, the club decides to rennovate an abandoned greenhouse conservatory run by a public trust, so that they won’t continue to bother Mrs. Haberman. There are other subplots going on, like Stacey’s crush on the much older, Luca, Claudia’s worry that she will be forced to quit the club if she cannot pass her biology class, and the club’s snobby rivals, who plan to trash the Babysitters’ new clubhouse just before it is to be inspected by the conservancy trust board of directors. As you might expect, these elements all work themselves out in the end, and the club members are better off for their experiences. Kristy tells Matt, one of the day camp kids, that she has to leave. If Kristy seems somewhat familiar to you, it’s because she is played by Schuyler Fisk, who is the daughter of Sissy Spacek, and you really can see the resemblence once you know the connection. 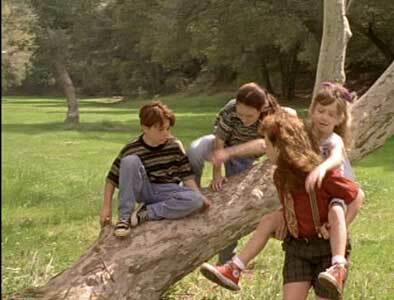 Kristy along with the other Babysitters Club members are all nice people, so this is a film that is “safe” for the whole family to view. The kids are obviously from an affluent community, but by and large they seem unaffected by this, unspoiled and genuinely interested in helping themselves and others in their town. We are so used to seeing films about teenager who bully each other, use a lot of vulgar language, or are obsessed with their emerging sexuality, that it is a pleasant surprise to see a film where the normal problems of teenagers end up being a catalyst for these girls to form an even tighter sorority. Peter Horton puts in a good performance as Kristy’s smooth-talking but wayward father. Although he has been out of her life for a number of years, she still responds to his charms. And his desire to keep his presence secret is the catalyst for a real lesson in values for Kristy — how long can she maintain the secret from her current family and friends, especially when her whole life seems devoted to openness and honesty? These issues represent the serious side of this film, although it is mostly a pleasant and sentimental look at everyone’s model image of teenage life in the suburbs. Enjoy this film for what it is, an entertaining diversion that makes you feel good at the end. 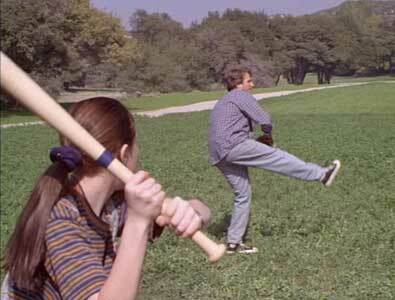 Kristy plays baseball with her dad. Kristy laces up a new pair of white high top chucks she got for her birthday. 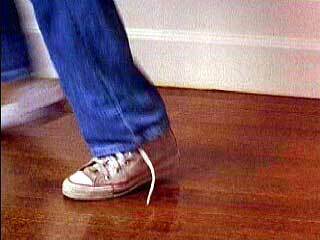 There is a lot of good chucks cinemaphotography in The Babysitters Club, starting with the opening scene where we are introduced to Kristy while the camera focuses on her worn, unbleached white high tops. These chucks are her favorite footwear which she always wears along with denim and backwards caps. 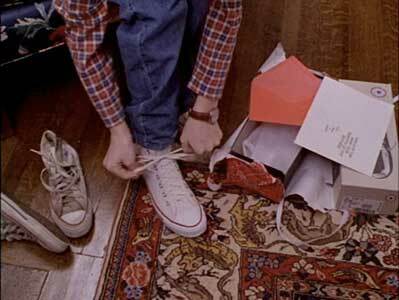 Besides the opening sequence, there are good closeups of her walking when she meets up with her dad, dances for the kids, and best of all when she receives the chuck lovers favorite present on her birthday — a brand new pair of high top chucks. 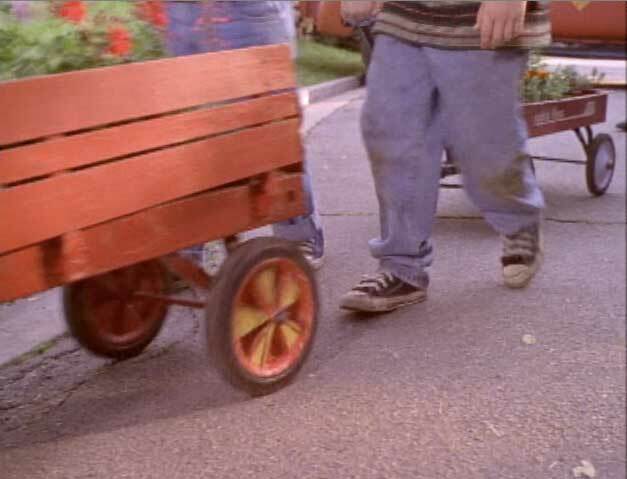 Besides Kristy, her father Patrick wears black high tops in most of his scenes, providing us with some good shots of them both wearing their high top chucks. As an added bonus many of the summer camp kids wear black, blue or red high tops. 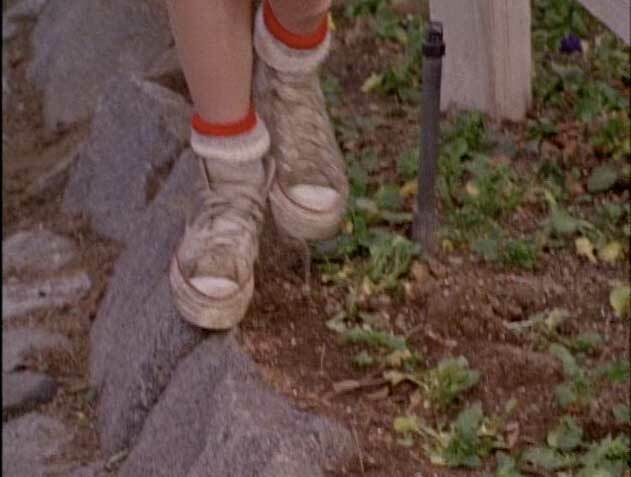 Click the thumbnails to see a few of the chucks closeups from The Babysitters Club. The Babysitters Club. (1995) Schuyler Fisk, Bre Blair, Rachel Liegh Cook, Larisa Ollynix, Tricia Joe, Stacey Linn Ronsower, Zelda Harris, Christian Oliver, Bruce Davison, Ellen Burstyn, Peter Horton, Lance O’Reilly, Aaron Michael Metchik, Asher Metchik. Directed by Melanie Mayron. Categories: Comedy, Coming of Age, Family.